Griz and Bobcat Fabric Update! Unfortunately, it is monsoon season in Indonesia, and that means its too rainy to dry our beautiful fabric on the beach! Our shipment has been delayed, but should be arriving the end of this month. 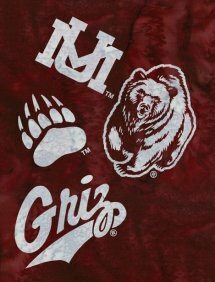 If you have already pre-ordered the Griz batik we will cut your yardage first and call you so you know its ready to pick up. We also will be getting in the Bobcat batik. Mug rugs are certainly popular, cute and easy to make! Join LaRee and make one a month. This month is this adorable penguin! Pattern available at class time. Make this super quick table runner in time for Valentine's Day! 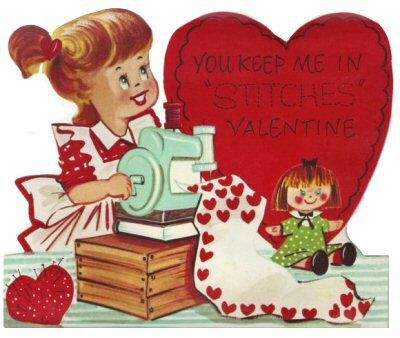 Just add a candle (or a dish of chocolates) and you are set! You can make this in an afternoon. 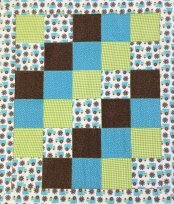 Pattern is by Cut Loose Press and is only $3.50. 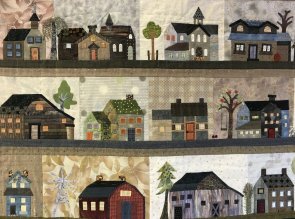 This class will start at the very beginning and teach you how to rotary cut, accurately piece, and put on borders. This triple rail fence is fun and easy for a beginning project. This super cute receiving blanket is really quick and easy to make! 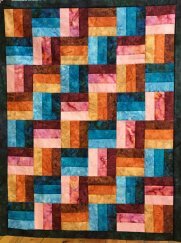 Sarina did simple patchwork for the front, or you could use a solid piece of flannel. Come whip one up today for that new baby!